Bradford’s Victorian prosperity was boosted by the dyeing trade led by the firm of Edward Ripley & Sons, and the invention of mechanical combing by Samuel Lister of Manningham Mills – and from the remarkable influx of German immigrant merchants, such families as Schuster, Behrens, Zessenheim and Moser, whose warehouses clustered on the hill that is now known as Little Germany within the tight network of streets above Leeds Old Road. 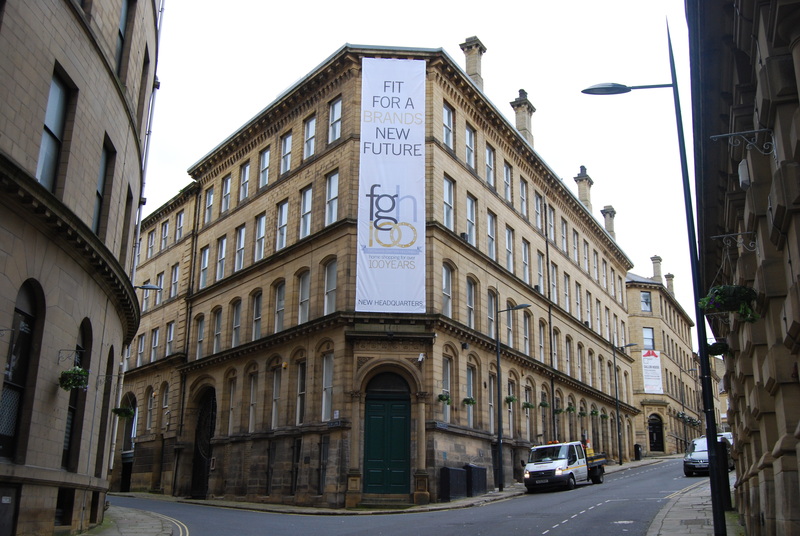 Most of these companies were already established in Bradford before they moved into the grand warehouses in the 1860s and early 1870s. They were encouraged to diversify when trade was interrupted by the Franco-Prussian War of 1870-1, only to suffer a sudden economic downturn from 1875 onwards with the introduction of tariff barriers by France, Germany and Austria. At the same time unexpected changes in female fashions caught manufacturers unprepared, and though the Bradford wool trade eventually adapted, no further buildings were constructed in Little Germany until 1902. The impressive architectural display of the Little Germany stuff- (ie, worsted) warehouses masks a tightly-organised functional building-type, comparable with the cotton warehouses of central Manchester. John S Roberts, in Little Germany (Bradford Art Galleries & Museums 1977), describes in detail how “grey” cloth was brought into the ground-floor receiving bay, promptly sent out for dyeing and, on its return, hoisted by steam-power to the top floor for inspection and sorting, stored and then after sale sent to the ground-floor packing area for dispatch. Only wholesale customers and senior staff used the front entrance and the show staircase to the upper floors. Many of the Little Germany buildings were designed by the local architect Eli Milnes (1830-1899), in some cases as speculative developments. Milnes was in partnership with Charles France (1833-1902) from 1863 onwards. The other local architectural practices – Andrews & Delauney, Lockwood & Mawson and Milnes & France, together with the Leeds architect George Corson, participated in the short-lived building boom. After the decline of the Bradford woollen industry in the 1960s and early 1970s almost all of the Little Germany buildings were redeveloped: many warehouses became offices, and a former temperance hall was converted into a theatre, initially known as The Priestley after the novelist who was its first president, and eventually in 2012 relaunched as Bradford Playhouse: http://www.bradfordplayhouse.org.uk. In 2012 the mail-order clothing company Freeman Grattans Holdings, an amalgamation of the London-based Freeman Company and the Bradford-based Grattan, moved into 1860s offices at 66-70 Vicar Lane within Little Germany. FGH has a German owner, Otto UK. The 80-page, A4 handbook for the 2012 Yorkshire Mills & Mill Towns tour, with text, photographs and a reading list, is available for purchase, price £15.00 including postage and packing. To view sample pages click here. Please send a cheque, payable to Mike Higginbottom, to 63 Vivian Road, Sheffield, S5 6WJ. This entry was posted in Victorian Architecture, Yorkshire Mills & Mill Towns on January 15, 2015 by Mike Higginbottom. John Edward Wainhouse (1817-1883) was the owner of the Washer Lane Dyeworks on the side of the Calder valley below King Cross, on the southern outskirts of Halifax. In 1870 he leased the works to Henry Mossman, and at the same time responded to complaints about atmospheric pollution, particularly from a neighbour, Sir Henry Edwards Bt (1812-1886) of Pye Nest, by commissioning an extremely tall chimney, 253 feet high, connected to the works below by an underground flue. Construction began in 1871, the year after the passing of the Smoke Abatement Act which required that industrial smoke should be carried away at a height. 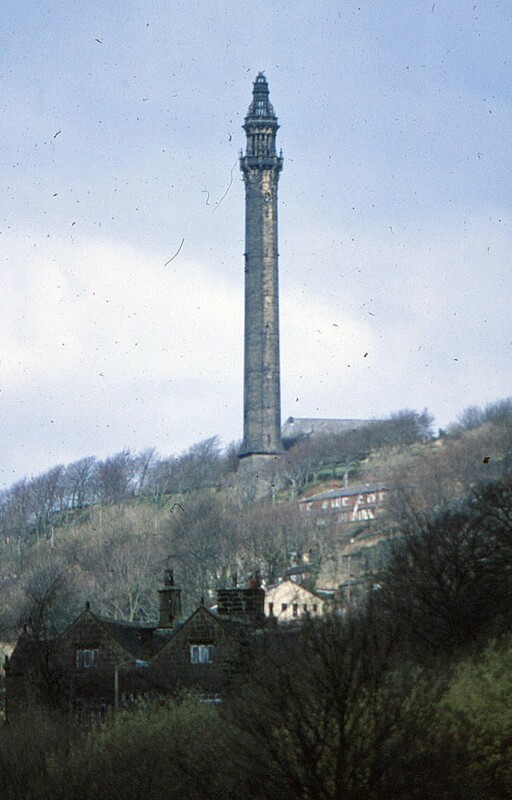 J E Wainhouse instructed his architect, Isaac Booth of Halifax, to encase the functional brick chimney in stone, with a spiral staircase of 403 steps to the top. The purpose of installing a staircase at considerable expense to the top of a smoking chimney was never clear: a regularly repeated legend is that J E Wainhouse wished to annoy Sir Henry Edwards, who was High Sheriff of Yorkshire in 1872, by overlooking his residence. In 1874 J E Wainhouse sold the dyeworks to Edward Mossman, who declined to take on the cost of the chimney, so instead Wainhouse took on the liability of what became a tower instead of a chimney, resolving to turn it into a “General Astronomical and Physical Observatory”. He dismissed Isaac Booth, who in any case appears to have grown sick of being caught in the midst of the feud between Wainhouse and Edwards, and commissioned Booth’s assistant, Richard Swarbrick Dugdale, to finish the architectural treatment of the tower with an elaborate gothic cupola that is so densely embellished that it is practically useless as an observatory, except to look down on neighbouring properties and to admire the distant views. By the time this second phase of construction was completed on September 9th 1875, the entire project had cost £14,000 or £15,000. By 1893, ten years after J E Wainhouse’s death, it was open as a public attraction and in 1909 it was operating a radio transmitter. Suggestions in 1912 that it should be adapted as a crematorium came to nothing, but in 1919, prompted by a campaign in the Halifax Courier, Halifax Corporation bought it; the Corporation and its successor, Calderdale Borough Council, have maintained it ever since. Its only practical function appears to have been as an observation post in World War II. It was substantially repaired and restored in 2008 at a cost of £400,000, and reopened to the public on May 4th 2009. It is open on bank holidays, and available for private openings at other times. This entry was posted in Victorian Architecture, Yorkshire Mills & Mill Towns on January 28, 2014 by Mike Higginbottom. The Bradford Jewish communities were never numerically large, perhaps a hundred families in the late-nineteenth century, but they were extremely influential. The German and Danish Jews whose warehouses are now called “Little Germany” were not refugees, but came in search of prosperity in the early decades of the nineteenth century. They assimilated, and then coalesced into the city’s Reform Congregation. From their ranks came four Bradford mayors, including Charles Joseph Semon (1814-1877; Mayor 1864-5) and Jacob Moser (1839-1922; Mayor 1910-11), as well as the merchant Sir Jacob Behrens (1806-1889) and Professor Friederich Wilhelm Eurich (1867–1945) who led the search for a cure for cutaneous anthrax or “wool-sorter’s disease”. The composer Frederick Delius (1862-1934) and the painter Sir William Rothenstein (1872-1945) both came from Bradford German-Jewish families. 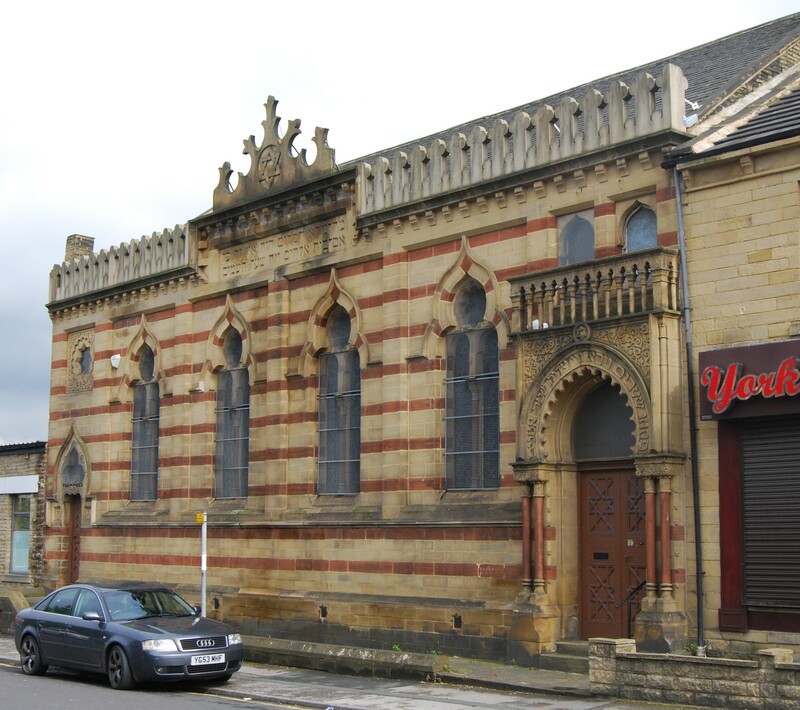 This Reform Congregation built the magnificent Moorish Grade II*-listed Reform Synagogue on Bowland Street, designed by T H & F Healey in 1881, a rare and fine survival of the Islamic Revival style. In the 1880s, fleeing the pogroms that followed the assassination of Tsar Alexander II, came Russian Jews who disliked the practices of the Reform Synagogue and founded their own Orthodox Synagogue in Spring Gardens in 1906. 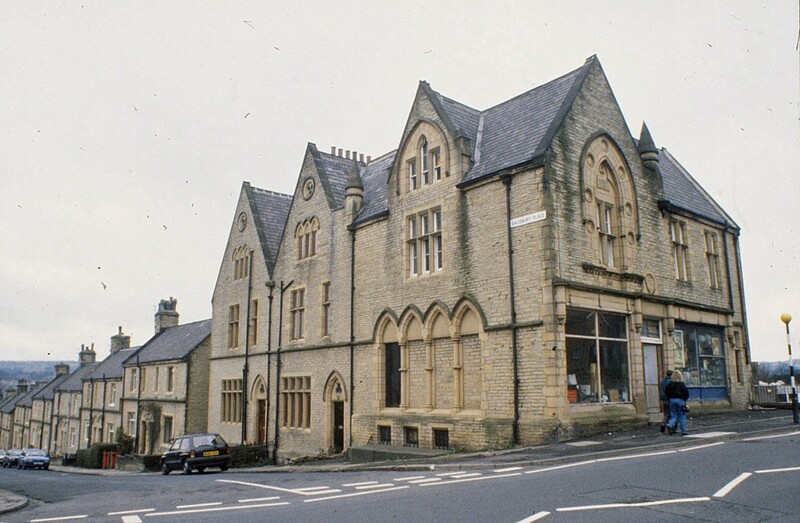 The Orthodox community were sufficiently confident of their future to close the Spring Gardens synagogue in 1970 and move to a modern building at Springhurst Road, Shipley. The Spring Gardens building, with the inscription above its doorway, “How goodly are your tents, O Israel”, is now the Al Mumin independent Muslim primary school, and the Orthodox Congregation had to close their Shipley synagogue in April 2013 because they no longer had sufficient numbers to hold services. Meanwhile, the Reform Congregation of around thirty-five people somehow manages to maintain their building and hold monthly services: http://www.bradfordsynagogue.co.uk/index.htm. Among the supporters who have helped this tiny community financially are the Bradford Council of Mosques and other members of the local Muslim community: http://www.bradfordsynagogue.co.uk/index.htm. This entry was posted in Sacred Places, Survivals & Revivals: past views of English architecture, Victorian Architecture, Yorkshire Mills & Mill Towns on January 27, 2014 by Mike Higginbottom. 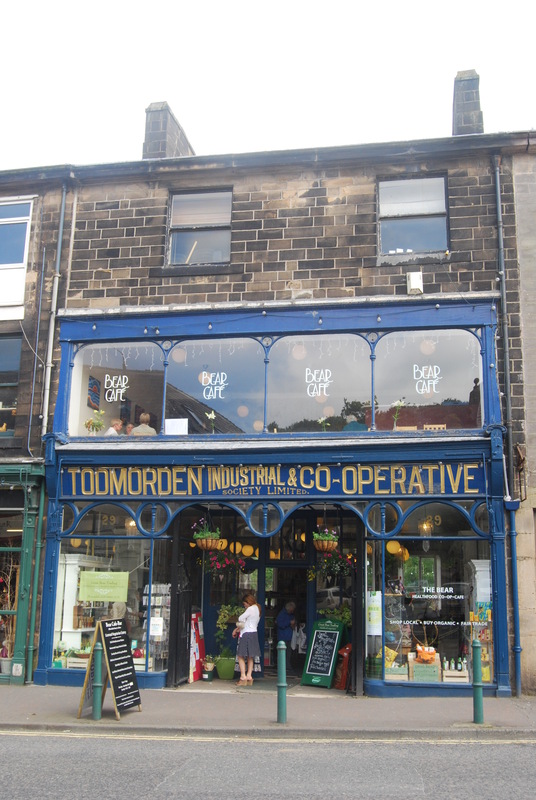 When I’m hungry in Todmorden, on the Yorkshire/Lancashire border, I head for the old-fashioned Co-op. 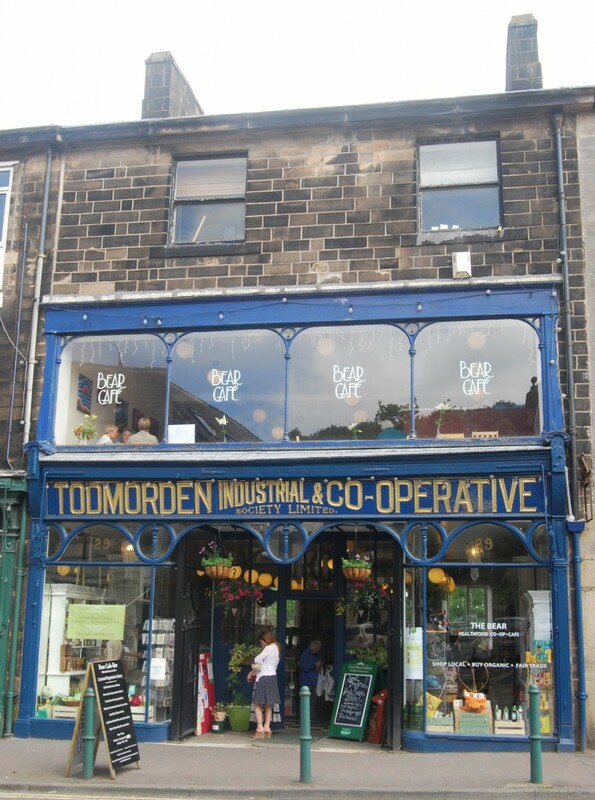 It’s not a co-op any more, though it retains its splendid iron-and-glass two-storey shop front emblazoned with the title ‘Todmorden Industrial & Co-operative Society Limited’. The building dates from the 1860s, and was refurbished when the Co-operative Society took it over as its haberdashery department in 1910. Now it’s the Bear Café [http://www.bearco-op.com/cafe], a vehemently wholefood shop and café bringing the very finest local produce in conjunction with the food hub Incredible Edible Todmorden Unlimited: http://www.incredible-edible-todmorden.co.uk. Sometimes you simply can’t get a seat at the Bear Café, so next door is Bramsche Bar [http://www.bramsche.co.uk/about], a little more relaxed and slightly less purist, offering alcohol and meat for those who’re so inclined. I had eggs Benedictine, which is a combination of the ham and spinach components of Benedict and Florentine. There used to be a nice little café with interesting posters in the loo which has now been transformed into Hanuman Thai & 3 Wise Monkeys Pub [http://www.hanuman-thai.com/?q=node/1] which might be worth a look. This entry was posted in Life-enhancing experiences, Yorkshire Mills & Mill Towns on January 24, 2014 by Mike Higginbottom. At the same time that Colonel Edward Akroyd set out his model village of Akroyden in 1855-6, he began work on his greatest gift to the locality, All Soul’s Church, Haley Hill. He employed George Gilbert Scott, who also provided the original layout for the village, to design the grandest possible statement of High Anglican pride, a fourteenth-century Gothic church with a tower 236 feet high, one foot higher than that of his carpet-manufacturing rivals, the Crossleys’,Congregational Square Church down in the valley below. Scott was and is generally regarded as the best architect alive at the time, and Scott himself described All Souls’ as “on the whole, my best church”. As might be expected, the finest decorative materials were used – Minton tiles, glass by Clayton & Bell, Hardman & Co, and William Wailes, ironwork by Skidmore & Co, the font of Lizard serpentine marble standing on an Aberdeen granite base, Caen stone for the pulpit, alabaster for the reredos. The tower houses a ring of eight bells by the Whitechapel Bell Foundry, and the four-manual Foster & Andrews organ of 1868 was the biggest in Halifax. This huge church became redundant in 1979, and stood neglected until 1989 when the Churches Conservation Trust took it over. Unfortunately, the Steetley limestone Scott chose for the structure reacted badly to atmospheric pollution, and the twin tasks of conserving the fabric and securing it against vandalism are prodigious. 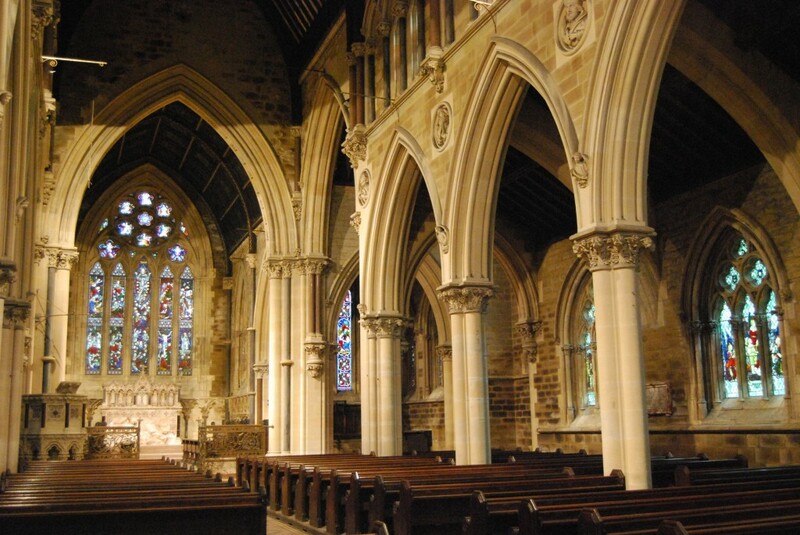 Details of access and coming events at All Souls’ are at http://www.visitchurches.org.uk/Ourchurches/Completelistofchurches/All-Souls-Church-Halifax-Haley-Hill-West-Yorkshire. Graham White’s fine set of photographs is at http://www.flickr.com/photos/strabod72/sets/72157627625944270/with/6128063605. This entry was posted in Sacred Places, Survivals & Revivals: past views of English architecture, Victorian Architecture, Yorkshire Mills & Mill Towns on January 9, 2014 by Mike Higginbottom. When Colonel Akroyd came to build his second model village in 1855 (the first was Copley), he went upscale, as the Americans say. Influenced by the growing permanent building society movement, he planned housing for his Haley Hill Mills, overlooking the centre of Halifax, to be purchased rather than rented by his workers. He donated the land, adjacent to his own residence, Bankfield, and arranged for the cost of building to be underwritten by the Halifax Permanent Building Society. The community was named Akroydon and all the streets were named after Anglican dioceses. However, he found that potential freeholders are not so pliable as prospective tenants. Being Yorkshire people, they first regarded the whole thing as a speculation, and shunned it. Scott’s former pupil, W H Crossland, later the architect of St Stephen’s Church, Copley, recast the scheme as 92 houses “clustered around a market cross in a toned-down Gothic style ‘simple, yet bold in detail’”. The occupiers find their new homes commodious in every respect, with abundance of light; and their prejudices against the pointed style are now finally uprooted. They are much gratified by one feature recently introduced, viz, the insertion of the owner’s monogram or device, on a stone shield, placed over the door, with the intent to give individuality and a mark of distinction to each dwelling. These Englishmen’s homes were indeed their terraced ancestral castles. This entry was posted in Survivals & Revivals: past views of English architecture, Victorian Architecture, Yorkshire Mills & Mill Towns on January 9, 2014 by Mike Higginbottom.